Boots come in a variety of heights, colors, and materials. I usually opt for brown or black but am feeling a deep red (burgundy, bordeaux, oxblood, wine, etc.) pair this season like the ones found here, here, and here. If you happened to follow those links, you probably noticed they have more in common than just color. They’re all booties, have a moderate block heel, and are shaped with an almond toe. Booties are a very versatile choice for fall and a great option for gals on the shorter side like myself. (When wearing a longer blouse, you don’t run as a great of a risk at making your legs look stubby as you would with a riding boot hitting right below your knee.) Booties are especially flattering with a heel and an almond toe. A block heel allows a boot to be dressed up or dressed down, while still lengthening your legs with added height. And the almond shape makes for a more comfortable pair of shoes than a pointed toe while also elongating the figure, which, by the way, a rounded toe could never do. Roll up the sleeves of a gingham button-down shirt, pair it with a denim skirt, and add a cuff bracelet to keep things simple. When the weather turns cooler, this look could be layered with a sweater and cable knit tights. I love the combination of hard and soft elements in an outfit as well as a great grey jean. This outfit has all three. The scarf is sure to keep you warm, and the boots compliment the edginess of the jacket. 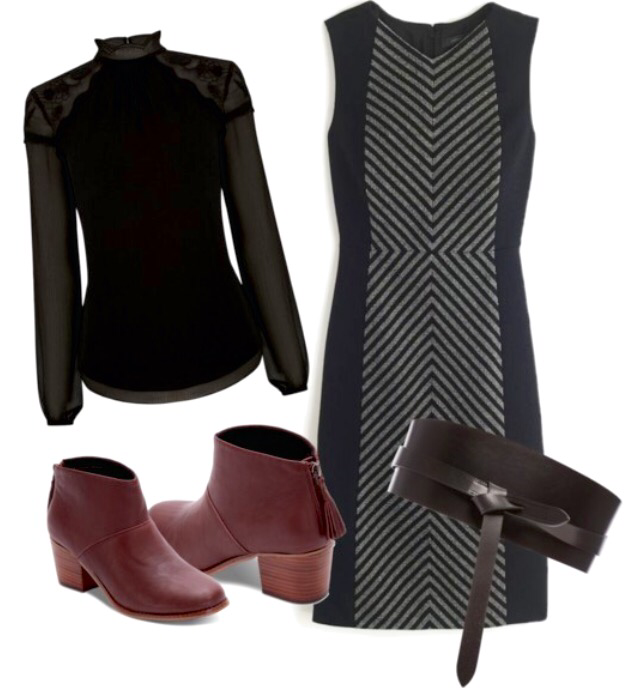 Layer a high-neck blouse under a sheath dress, define your waist with a wrap belt, and slip on some black tights to dress up your booties for a night out or chic dinner party. How will you wear booties this fall? Ps. The featured photo is c/o of the Toms website. If you’re not familiar with Toms, check them out! They’ve expanded their shoe selection to 10+ signature styles, and when you buy a pair, they’ll give a pair to someone in need. One for one.